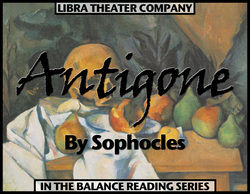 In this perilous tragedy, the strong-willed Antigone defies the law of the state in order to do honor to her deceased brother. But through her seemingly good-intentioned decision, the young woman spurs a series of events that bring tragedy and destruction to all those around her. Please join Libra Theater Company as we bring this poetic, tragic story to life.